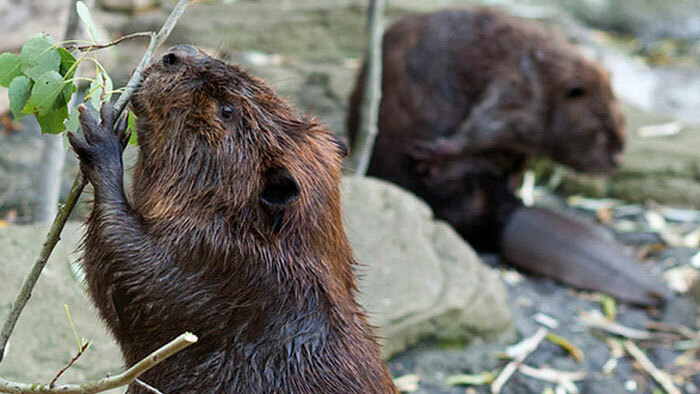 Beavers don’t just live off the land—they modify it to fit their needs. Only humans change the landscape more. A beaver’s hard work creates valuable wetlands, but occasionally problems for people living nearby. In spring and summer, beavers eat leaves, twigs, fruit, ferns, and the roots of aquatic plants. In fall and winter, they eat tree cuttings they’ve stored beneath the water. Beavers dam woodland streams to make the wetlands they prefer. Using their large front teeth, beavers cut down trees. They use the trees to build dams and lodges. Beavers use their large tails as rudders while swimming. Minnesota has more beavers than miles of river. Head & body: 23-39 in. Length of tail: 8-12 in. Lifespan: 10-12 years (wild); up to 19 in captivity. Because beavers’ front teeth never stop growing, they must gnaw, chew, and chop wood constantly to keep them filed down. Beavers’ ability to survive winter depends on the condition of their coats. They groom their fur regularly using the claws on their hind feet as a comb. A special gland at the base of the tail provides oil (like a hair tonic) that is worked into the fur to waterproof it. A thick skull supports large teeth for gnawing, and serves the same purpose as a hard hat, helping protect beavers from falling trees. Beaver dams can become quite large-as much as a half mile long. That’s four times as long as the entire Minnesota Trail. The pelt of a beaver is comprised of long, coarse guard hairs over a thick, wooly undercoat. This luxuriant pelt lured early trappers and voyageurs to Minnesota and actually led to the early exploration and settlement of our state. Beavers are slow on land, but excellent swimmers. A beaver can spend 15 minutes underwater before coming up for air. A prop to steady the beaver as it sits up on its hind legs to cut down a tree. A cushion to sit on while grooming. A place to store fat for long winters. An alarm paddle to slap the water’s surface and warn other beavers of danger.